A few years ago I was working on a book largely about music. I asked people to write lists for me. The most influential albums from their lifetime. In my opinion, those lists remain the best poetry in the book. So I had to confront my own list. Leonard Cohen was untouchable. I’m not a fan of poems about poetry—or at least, I’ve never been able to pull it off—and that’s all Cohen is. Poetry. I got a tattoo instead. It was a cold, vivid February morning in Manhattan. I took the day off work. My appointment was at simple studio with people paying a lot of money for ink that requires several sessions. 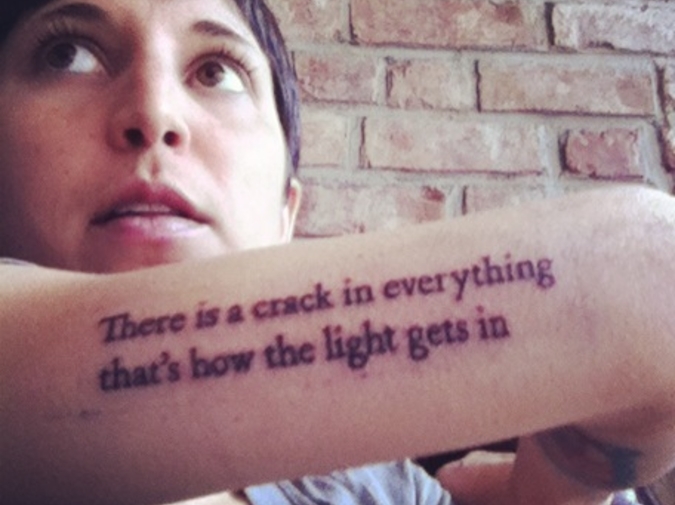 “There is a crack in everything / that’s how the light gets in.” On my right tricep. It’s perfect. I went to the Bowery Hotel after and drank scotch and soda for the rest of the afternoon. Just Cohen and me. Leonard Cohen is adult music. When I first heard, “I’m Your Man,” I felt very grown up. “If you want a boxer, I’ll step into the ring for you.” When Cohen says that: when he says, “I’m your man,” it’s exactly what everyone wants to hear. Man or woman, straight or not, it is the definition of craving. Read everything you can by Cohen, and about him. He is an incredible life. He just turned 82, and even he says he won’t last much longer. Which is a crisis. The world will be a much less romantic place without him. With his latest, and possible last album, he transcends musician and bellows lines of darkness with Montreal’s Cantor Gideon Zelermyer and the Shaar Hashomayim Synogogue Choir backing him. Everything he speak-sings here is a gift. And with song titles like, “Leaving the Table” and “Traveling Light,” this seems a solid sign-off. Although, after saying he was ready to die, he followed it up by saying he’d live forever. Perhaps there will be a resurrection album; I’m counting on it. Scotch & soda on the rocks. Flashes of Life is Micah Ling's most recent collection of poetry. She lives in the mountains of Colorado.